Well, it’s time to make my final contribution to the vast canon of humor inspired by the Sarbanes-Oxley Act of 2002. What more can one contribute to the Sarbanesian oeuvre? Haven’t the late night comedians already dissected every clause of this hilarious piece of federal legislation? Possibly. Nevertheless, I humbly submit two more greeting cards. This first one is a get-well card. 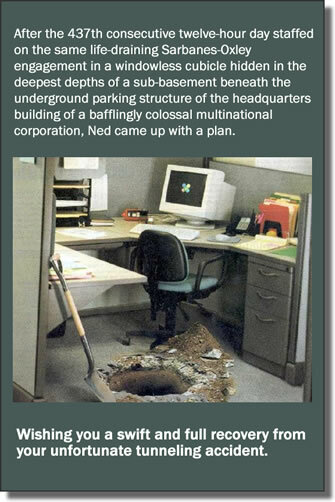 In those early days performing 404 audits, what audit staff person didn’t feel like tunneling their way to freedom? Too bad about Ned. He should have used salvaged monitor stands to build a support structure in his tunnel. It’s not that time of year but it’s never too early to plan for St. Patrick’s day. So, why not send this card with a peppy limerick celebrating Former Senator Paul Sarbanes and his signature act? I believe, actually, the Senator has mainly Greek heritage but we’re all Irish on St. Patrick’s Day.